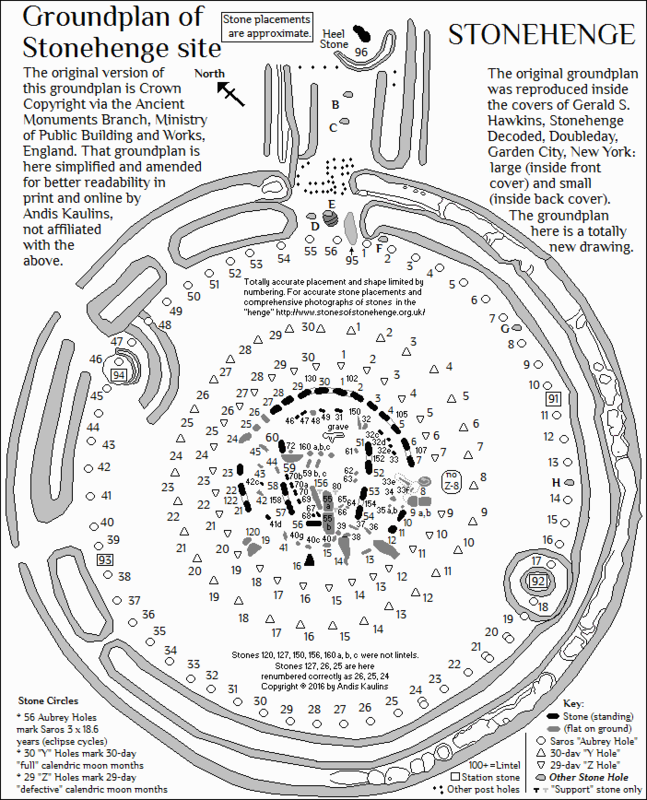 To enable readers to follow subsequent astronomical identification of stones and parameters at Stonehenge more easily, we present here our own extended original drawing of the Groundplan of the larger Stonehenge site. A further interpretative groundplan map -- with a unique view of the "station stones" and the purpose of Stonehenge generally -- follows in the subsequent posting. Please note that the black marks represent upright stones. Many of the stones that mainstream archaeologists think of currently as "fallen" were in fact intentionally placed horizontally, as at Arbor Low. See our previous posting at Stonehenge Deciphered. Such "flat" placed stones are marked grey in color. Our placements of earthworks and stones in that drawing are not perfect (but we trust close enough to be useful). They are based on the fundamental Stonehenge groundplan drawing -- protected by Crown Copyright, and hence not used by us in the original here -- as prepared by the Ancient Monuments Branch, Ministry of Public Building and Works, England, as that drawing was reproduced on the inside front and back covers of Gerald S. Hawkins, Stonehenge Decoded, Doubleday, Garden City, New York. In addition, we relied on a marvelously drawn map by Anthony Johnson at The Stones of Stonehenge to add more stones than those on the above cited map. Our own drawing is new because we needed to prepare a somewhat simpler presentation -- if the above drawing can be called "simpler" -- in which the numbering was better readable and some of the main features more visible, e.g. our simpler presentation of the outer hinge earthworks. Our placements are at best "approximate". This is not a professional survey. We also did not try to mirror exactly the shapes of the stones from above, although the shape of some stones from above is in fact important (stones 38 and 14, and 9a and 9b, for example). Some stones we show from the side (e.g. 16, the reason will become clear in the next postings). But first, let us take a look at an interpretative version of the above map, especially our view of the main axis and the so-called "station stones". The Ethics of Election Coverage: A novel take on objectivity. We agree fully with Glasser that many people on our planet, also many journalists, glibly pass off their biased personal opinions to the gullible masses as objective and neutral "truthy" thought-making, and that this is a common practice not just in the "election game", but also in academia. "What might be an alternative to objectivity, a better way to understand the role and responsibilities of a free and independent press?" . . .
We might describe what journalists write with the same sense of modesty Clifford Geertz uses to describe what anthropologists write: an “intrinsically incomplete” and “essentially contestable” account of the world. We might come to realize that, as Rorty insists, meaning endures in history, not in nature; there are no finally “correct” or “accurate” accounts of the world; all descriptions are interpretations in the sense that everything can be redescribed. We might [describe history] not as "a fixed thing, a collection of precise dates, facts and events that add up to a quantifiable, certain, confidently known truth" but "as a mysterious and malleable thing, constantly changing, not just as new information emerges, but as our own interests, emotions and inclinations change."